Yes, believe it or not, in spite of how fast some homes, in some price ranges and neighborhoods are selling, often the first day on the market, and in spite of how many St Louis markets are currently seller’s markets, giving seller’s the upper hand in negotiations, there are some buyer’s markets in St Louis, where the buyer actually has an advantage over sellers! To find these markets, there is no one statistic or piece of data that can identify it, but I use a couple to find those markets and will share what I feel are currently the best places in St Louis to be a home buyer today. One of the best ways to identify a buyer’s or seller’s market is to look at the month’s supply of homes for sale in a given market. It’s basic economics 101, supply and demand. At MORE, REALTORS, we have this data available live, online, at StLouisRealEstateSearch.com and compute it based upon data we obtain straight from the MLS. We simply look at the number of active listings in each market, then divide that number by the number of homes sold in the past 30 days to come up with how many months supply of homes are on the market at the current sales rate. 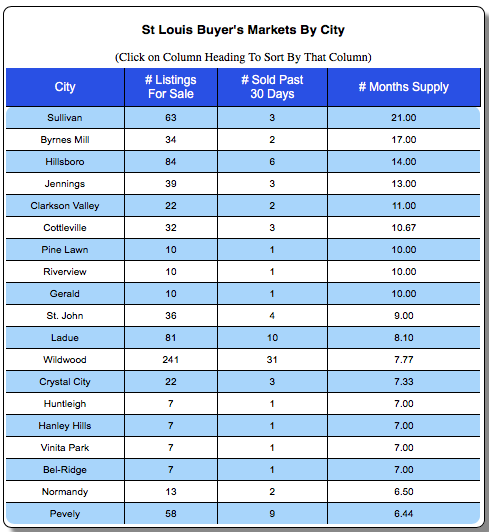 As the table below shows, there are currently 19 St Louis neighborhoods that, based upon this data, we are calling buyer’s markets since they have over a 6 month supply of homes for sale (6 months is considered a balanced market). At the top of the list is Sullivan, in Franklin County, with a 21 month supply of homes for sale, followed by Byrnes Mill, in Jefferson County, with a 17 month supply and then Hillsboro, also in Jefferson County, with a 14 month supply. The first city to appear on the list from St Louis county is Jennings, with a 13 month supply. Another good way to identify potential buyer’s or seller’s markets is to look at the average amount of time the current listings have been on the market, data which we also publish on StLouisRealEstateSearch.com. 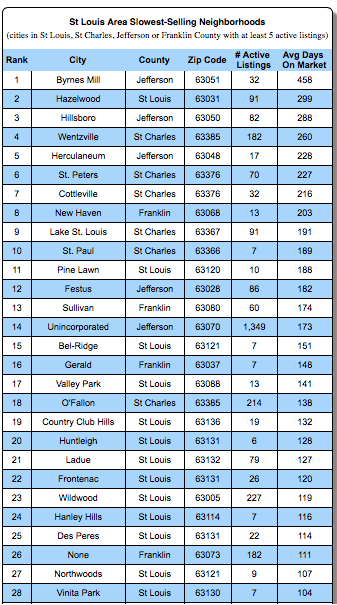 As the table below shows, there are 28 neighborhoods in St Louis where the average days on market for current listings is over 100. At the top of the list is Byrnes Mill, in Jefferson County, with an average of 458 days, followed by Hazelwood, in north St Louis County and then Hillsboro in Jefferson County. When you compare the table below to the table above and see the same city names, that is a pretty safe bet things are not going well in those markets and they are more likely to favor buyers than sellers.